Thank you for the interesting e-mail. The _Poems of Shelley_ buckram I own has the reinforced binding and the "torch bearer" design. It is like the ones illustrated on the "identifier's site." This cloth looks to me starch filled, although it doesn't seem to be from the casual text I applied to it. It is of a coarser weave than the Shelley version. It is still superior to the other Modern Library editions. I took a scan of it, for your edification (if that be the word). The book had no dust jacket, but I bought it for a quarter--the wrap, if there was any, might have been discarded. I suspect this is one of the varieties you describe: "the regular and giants of the Modern Library in the late '60s use a covering resembling buckram but without the required cloth reinforced strip on the hinges." Only I think that this cloth is buckram; in other words, it is buckram without the reinforcing cloth. Of the two pictures you sent, the left hand one, the lighter blue, looks to me a higher grade than the other, with more visible texture. 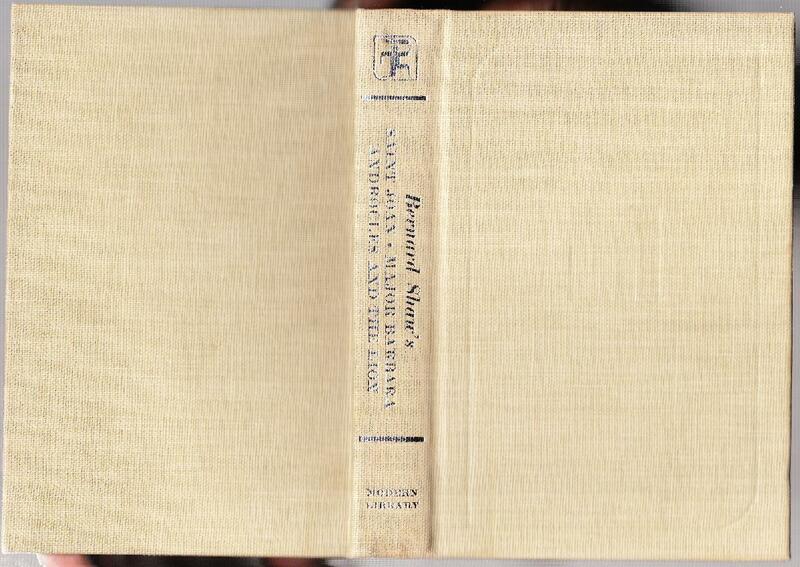 Buckram was the cloth of choice for concerns that rebound books for libraries; they would remove the text block, side stitch it, and then recase with buckram, often of the heaviest and most durable quality. Books from the 1920's so rebound are still usable today. Sometimes the paper wears out before the binding. Well--thanks much again for your interesting reply. I tried to look this up in my copy of Toledano's guide, but although good on many matters, he is not so adequate here. > observer of these buckrams, as I have a few myself. > which you asked about? Close weave, coarser weave? > burgundy, gray and mustard are consistent. > The "close weave" or "light blue" example dates to Spring 1967. > reinforced strip on the hinges. > signatures (but again, no date). Distracting more than irritating. > >> have a dust wrapper. > >> than the later? > >> the later ones one endpaper, whereas the earlier ones separated? > >> Have I asked this clearly? > >> Grateful for any information.